Levallois concept is one of the best known variants of prepared-core technologies, and is an important hallmark of stone technology developed at ~300,000 years ago in Africa and West Eurasia. Existing archaeological evidence suggests that the stone technology of East Asian hominins lacked a Levallois component during the Late Middle Pleistocene, and it is not until the Late Pleistocene (~40,000 to 30,000 years ago) that this technology spread into East Asia in association with modern human dispersal. In our paper, we present evidence of Levallois technology from the lithic assemblage from the Guanyindong Cave site in Southwest China. We applied optically stimulated luminescence technique to date the artefacts-bearing sediments, and obtained ages of ~170,000–80,000 years for the deposits. Our results provide the earliest evidence of Levallois technology in East Asia, and contemporary to those found in the West. The Guanyindong site was first reported in 1960s by Prof. Pei Wenzhong, one of the most famous archaeologists in China. Since it is one of the few sites that have yielded more than 1000 stone artefacts, Guanyindong has been considered as one of the most important Paleolithic sites in South China. Most of artefacts from Guanyindong were collected from the cave entrance during several excavations conducted in 1960s and 1970s. About one third of the artefacts were extracted from the upper layer (named Layer 2 or Group A by the original excavator Prof. Li Yanxian), and the rest were from the lower layers (Layers 4–8 or Group B). We analysed over 2000 stone artefacts from Guanyindong, and found evidence of Levallois concepts on 45 specimens (including cores, flakes and tools). Besides the Levallois pieces, we also found a number of non-Levallois flakes that show signs of platform preparation, supporting the presence of more generalised strategies of prepared-core technology. Figure 1. Photo of the Guanyindong cave entrance. The identification of Levallois artefacts raised an important question: when they were made? Answering this question, however, has been proved challenging in several aspects. Firstly, the chronology of this site is controversial, i.e., a wide range of U-series ages from ~ 50,000 to ~240,000 were reported. Secondly, the original stratigraphic information for most of the artefacts was totally lost due to a recent re-organising and re-labelling process at the Institute of Vertebrate Paleontology and Paleoanthropology (IVPP), so it is impossible to allocate any of the artefacts to a specific stratigraphic layer (or age). Figure 2. Photo of the residual profile (S1) of Group B showing tree roots penetrating the deposits. In order to resolve the chronological issue, in the summer of 2015, we visited the site. At the beginning it was very disappointing because we found that most sediments in the main excavation area from which the artefacts were extracted had been removed during the previous excavations. We could only found a thin block of residual profile (S1) attached to the south-wall at the cave entrance, where only the lower part (Groups B) is still visible. 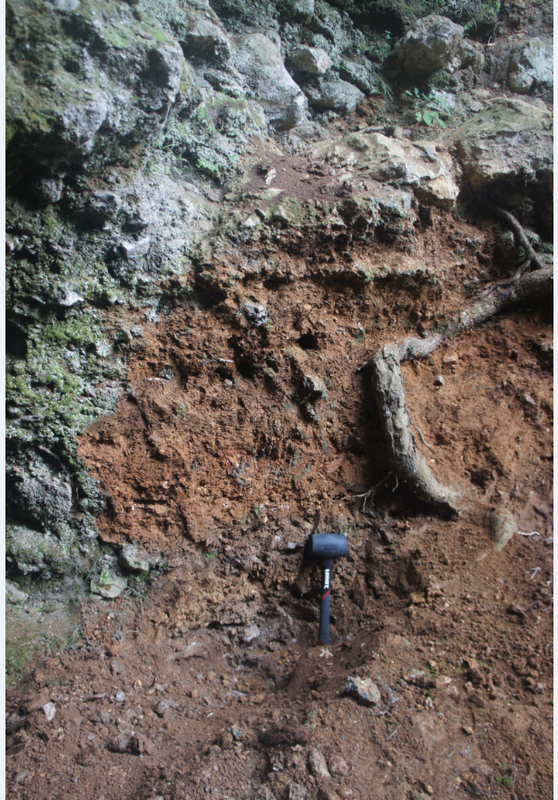 However, since the residual profile has been exposed for several decades since the last excavation in 1970s, post-depositional mixture was observed, e.g., modern tree roots penetrate deeply into the profile, which would bring difficulty for applying OSL dating. Thanks to the newly developed single-grain OSL method (a technique to date individual mineral grains), by looking at the ages obtained from individual grains we were able to identify and remove the contaminated grains from analysis. We found that all the samples from the lower layers (Group B) have a dominant population with ages around 170,000 years. This result is very exciting, as it shows that single-grain dating works well for the samples and, more importantly, this may represent the oldest Levallois technique discovered in East Asia. Figure 3. Sampling at the residual profile S1. From left to right: Bo Li and Yue Hu. However, this is not the end of story. Our field investigation in 2015 failed to find deposits from Group A. Although we established reliable chronology for the Group B, it is still possible that the Levallois cores were derived from Group A only. That means that we could not rule out the possibility that the Levallois technology at the site may date to ~40,000 or even younger (when Levallois is commonly found in East Asia). So determining the ages of Group A became the most pressing issue for this study. To address this problem, we re-visited the site in early 2018 with the hope to find something new. After arriving at the site, we realised that, compared to the summer of 2015, the outside of the cave entrance was covered by much less vegetation (because it was winter). Maybe we missed something covered by the dense vegetation? This time we investigated the cave outside carefully. 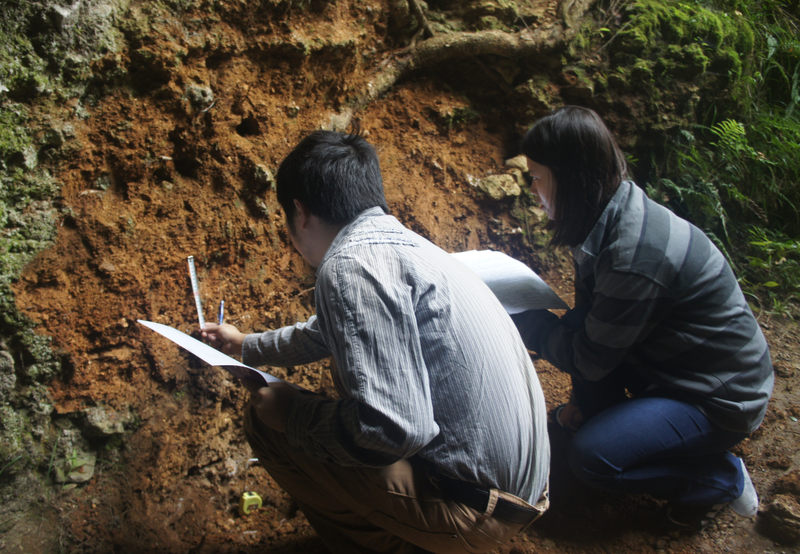 Luckily, with the helps from local cultural government department and a local farmer (Mr. Ma Dejun, who witnessed the original excavation in 1970s), we found another residual profile (S2) left from the 1970s excavation ~14 m outside the cave entrance. The reason we did not find this profile in 2015 is that it was sealed and protected by limestone and covered by dense vegetation. The new profile contains deposits from the upper layers (including Group A), which allowed us to take new OSL samples and constrain their ages. The ages for Group A are then estimated to 80,000 years. This means that, no matter which layers the Levallois artefacts were from, their ages could be securely placed to ~170,000–80,000 years, which is still much older than other sites in East Asia that have shown Levallois technique. Figure 4. Crews of the 2018 fieldwork. From left to right: Jia-Fu Zhang, Ya-Mei Hou, Yue Hu, Bo Li, Yu Su, De-Jun Ma. Apart from additional chronology work, further progress was made after the 2018 fieldwork. 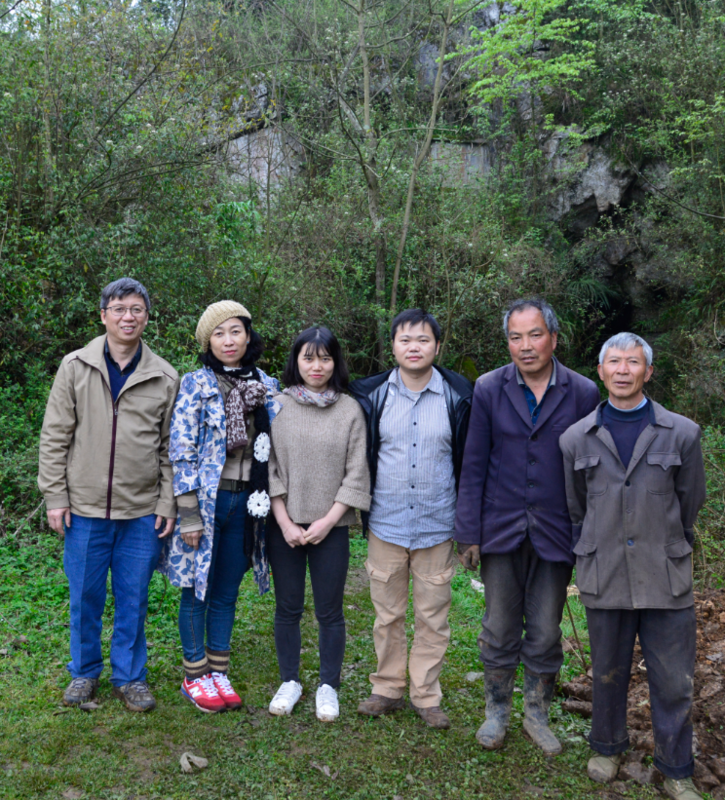 We re-visited the IVPP and talked to Mr. Lou Yushan­­ who was involved in archiving and labelling the Guanyindong stone artefacts. With his help, we successfully extracted stratigraphic information from 204 stone artefacts, which were not re-labelled (because they were stored in a different place). Among these, 5 of them were identified as Levallois, including 3 from Group A and 2 from Group B. This suggests that Levallois technique was actually present in both Groups A and B. 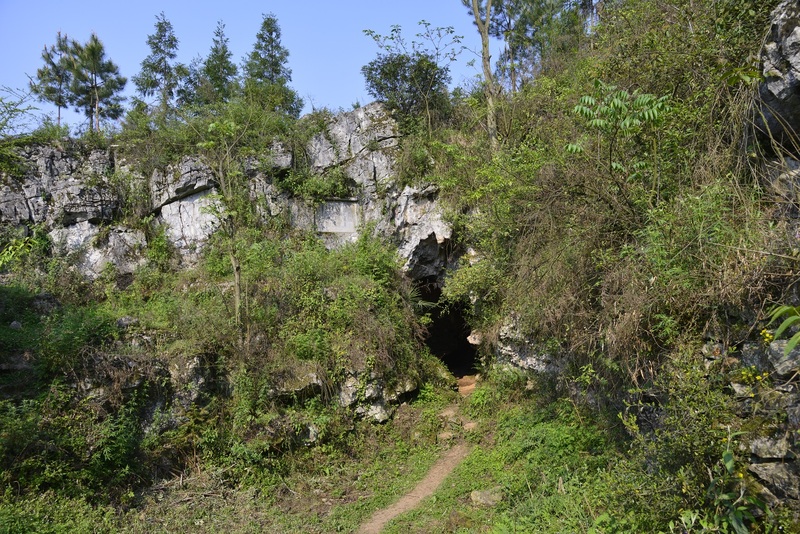 Therefore, the Levallois artefacts from Guanyindong Cave could be dated to as early as ~170,000 years, providing the earliest evidence of prepared-core technology in East Asia.